This feature highlights a number of meteor showers, comets and asteroids which are visible during the month of October 2010. Venus – Venus starts the month very low in the SW sky at sunset. By the end of twilight it has already set. Conditions only get worse as it descends towards the Sun. By mid-month, Venus is invisible in the evening sky. After passing inferior conjunction on the 29th, Venus will rapidly climb higher in the morning sky and should be visible by early next month. Mars – Mars continues its slow grind lower in the southwestern evening sky. At a relatively faint (for a planet anyway) magnitude of +1.5, Mars is only visible low in the SW during evening twilight. Jupiter (and Uranus, too…) – This month the ‘King of the Planets’ is also the ‘King of the Evening Sky’. At magnitude -2.8 Jupiter is the brightest ‘star’ in the eastern evening sky. It is currently located on the Pisces/Aquarius border. If you have a pair of binoculars or small telescope take a look at Jupiter. See if you can see any of its 4 bright Galilean moons or 2 large atmospheric belts. In addition, Jupiter is within 3° of +5.7 magnitude Uranus all month long. Saturn – Saturn starts the month behind the Sun. By the end of the month, the +0.9 magnitude planet can be seen very low in the eastern sky during dawn. It is currently located in Virgo and will be for the next year or so. Mercury – Mercury is rapidly dropping towards the Sun at the beginning of the month. By the end of the first week of October it will be too close to the Sun to be seen. The Orionids are one of the most reliable and productive showers of the year. Another point in their favor, is their high level of activity over the course of ~5 nights or so. This gives ample opportunity to catch a few Orionid meteors. Unfortunately this year the nearly Full Moon will severely hamper watching this shower. The meteors that make up the Orionid shower were originally released by the one comet everyone has heard of, Comet Halley. Computer simulations of the past movements of Halley and its dust suggest that many of this year’s Orionid meteors were released by Halley between 1265 BC and 910 BC (for some points of reference, the Trojan War took place around 1200 BC and King David ruled around 1000 BC). The Orionids are usually active from Oct 3 to Nov 11 with a broad peak between Oct 18 and 24. During their peak, rates can be as high as 20-70 meteors per hour. During the last two years rates reached 40-45 meteors per hour which is nearly half the rate observed in 2007 (70 per hour). With a bright Moon-lit sky, actual rates will be much lower making this a dificult year to see the Orionids. The Orionids appear to come from an area in northern Orion. This area, called the radiant, rises around 10pm local time. It is best to wait till the radiant is high in the sky before looking for meteors (say 1am). The radiant is highest around 3:30am which is the best time to look. As you can see on the sky chart, the Moon is almost on top of the radiant. Meteors can appear anywhere in the sky so you don’t have to look at the radiant. More can be found at earlier Orionids posting from 2008 and 2009. 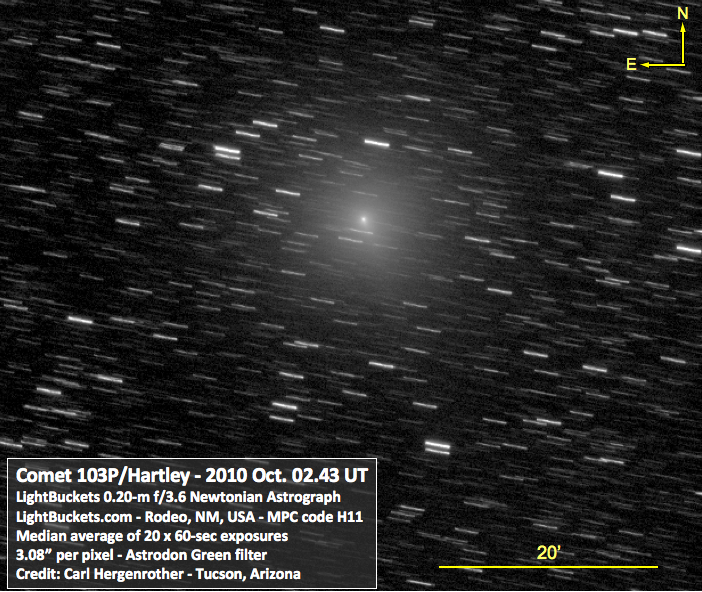 Comet 103P/Hartley 2 – Comet 103P/Hartley 2 should be the comet of the year. Currently as bright as magnitude +5.5 to +6.5 magnitude, naked eye sightings of this comet have already been reported from very dark sites. The comet will continue to brighten during the course of the month. The comet starts the month at a distance of 1.12 AU from the Sun and 0.18 AU from Earth. By mid-month it has moved into Andromeda and will be 1.21 AU from the Sun and 0.29 AU from Earth. Closest approach to Earth occurs on October 21 at 0.12 AU while closest approach to the Sun happens on October 28 at 1.06 AU. At the end of the month, Hartley 2 will be 1.06 AU and 0.14 AU from the Sun and Earth, respectively. 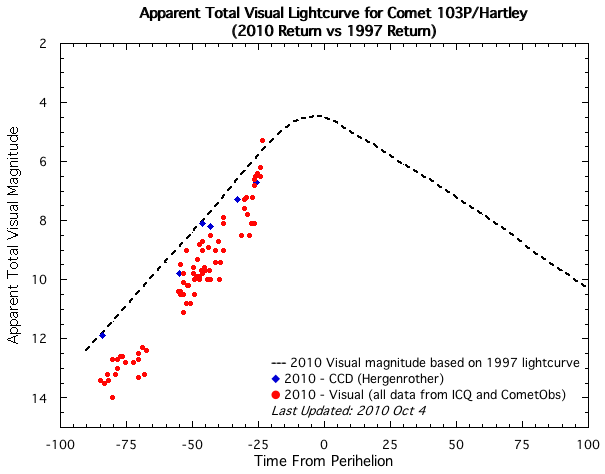 Last month there was concern that the comet was running much fainter than expected. Due to the large diffuse nature of its coma, many observers were underestimating the brightness of the comet. The comet still appears to be a little fainter than predicted but it should still brighten to a nice magnitude +4.5 to +5.0 by the end of October. Under very dark skies the comet can already be seen with the naked eye. For most of the rest of us, Hartley 2 is a large (30’+) diffuse fuzz ball. Under my moderately light polluted sky (LM +5.5), the comet was a difficult object in 10×50 binoculars. As always, the darker the sky the better. The comet is traversing the winter Milky Way and starts the month in Cassiopeia before running the length of Perseus and Auriga and ending the month in Gemini. It is visible all night long at the start of the month but becomes solely a morning object by mid-month. In early November the NASA EPOXI (ex-Deep Impact) spacecraft will encounter the comet giving us close-up views of the comet’s nucleus. These 2 large inner Main Belt asteroids will move in tandem this fall. Both are S-type asteroids with similar compositions and albedos. (6) Hebe is the larger of the pair (205 x 185 x 170 km). Recent research suggests that it is the source of many ordinary chondrite meteorites and near-Earth asteroids. (8) Flora is a little smaller (136 x 136 x 113 km) and is the largest surviving member of a numerous asteroid family created by a long ago impact. This month Hebe is retrograding in Cetus and will fade from magnitude 7.7 to 8.4. Just across the border in Aquarius Flora fades from magnitude 8.5 to 9.1.